Sergio Panariello lives and works in Naples, winner of the special jury award at the 2013 Nastro D’Argento, for directing the short film "CIRO" produced by Figli del Bronx, he participates in numerous national and international festivals, including the Festival internazionale del cinema di Roma. He had already made the following films: La trafila di Torre Annunziata (documentary, 2006), Villa Sora (documentary, 2008), Scuole aperte (documentary, 2008), the latter presented in 2009, within the NaVe project, at the 10th edition of Circuito Off in Venice. He later made the documentaries “Fuori campo - rom stories in Italy today" and "Windemi - The false dream of gold", both screened in various festivals and festivals. He directed the spot of Action Aid, "Let's help them at home" for The Jackal with whom he collaborated for the realization of several commercials, including Vodafone, Leerdammer, Babybel, Ford ... 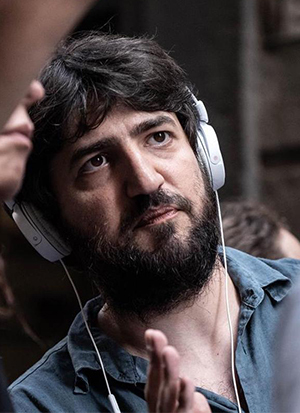 He started working on sets as an assistant director for the films: Mario's War by A. Capuano, Under the same moon by C. Luglio, Ossidiana by S. Maja. He was assistant director for the films "L'amore Buio" by A. Capuano (produced by Gianni Minervini, 2009), "Il Loro Natale" by Gaetano Di Vaio (documentary, 2009), "Là-Bas Educazione Criminale" by Guido Lombardi (production of Figli del Bronx - Eskimo and Minerva Pictures Group, 2010); "Take Five" by Guido Lombardi production Figli del Bronx - Eskimo and Minerva Pictures Group, "Troppo Napoletano" by Gianluca Ansanelli produced by Run Film and Cattleya lab, “Vieni a vivere a Napoli" by Guido Lombardi, “Ci devo pensare" of Francesco Albanese produced by Rai Cinema and Run film, for the pilot episode of the sitcom “Il tram”, directed by Monica Massa produced by Sky and Cinema Fiction in 2010, and for the short film “Vomero Travel” by Guido Lombardi, produced Indigo Film and Figli del Bronx. Casting for the short film "L'esecuzione" by Enrico Iannaccone, winner of the David di Donatello. Casting assistant for the two series of “7 lives”, sitcom produced by Rai and Publispei. He is currently engaged in the post-production phase of the short film titled "Tasso 12", which was shot in July 2018.